One can see that the application also implements memory management itself, but besides that, there is not much to it. Our input is concatenated with the global webroot variable to make up for the file that we receive eventually. We can see that there is a check for ‘..’ sequences in our path input to prevent path traversal vulnerabilities. However, when looking closely, the size_t unsigned long (0 – 4,294,967,295) path_len variable is casted to a long (-2,147,483,648 – 2,147,483,647) in the for loop that performs this check, indicating an integer overflow vulnerability. By sending a path larger than 2,147,483,647 characters and only then a “../../../../../../../../flag” sequence to get to the root, we could bypass the check. Right? Wrong. 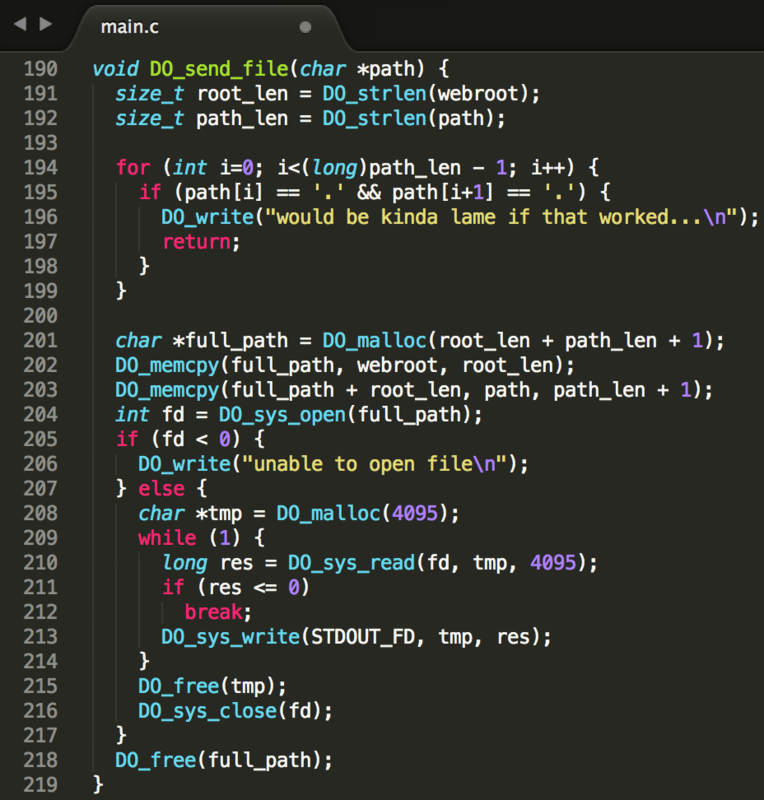 The maximum path length for the DO_sys_open(full_path) call was found to be 4096 characters, otherwise the call would fail. This is due to Linux PATH length limitations. Plus, we would have to send more than 2 gigabytes, and the process only supports 10MB of memory (see below). Bummer. This method allocates a buffer of static length 8191 and then keeps on writing bytes from STDIN to it, until a newline is detected. 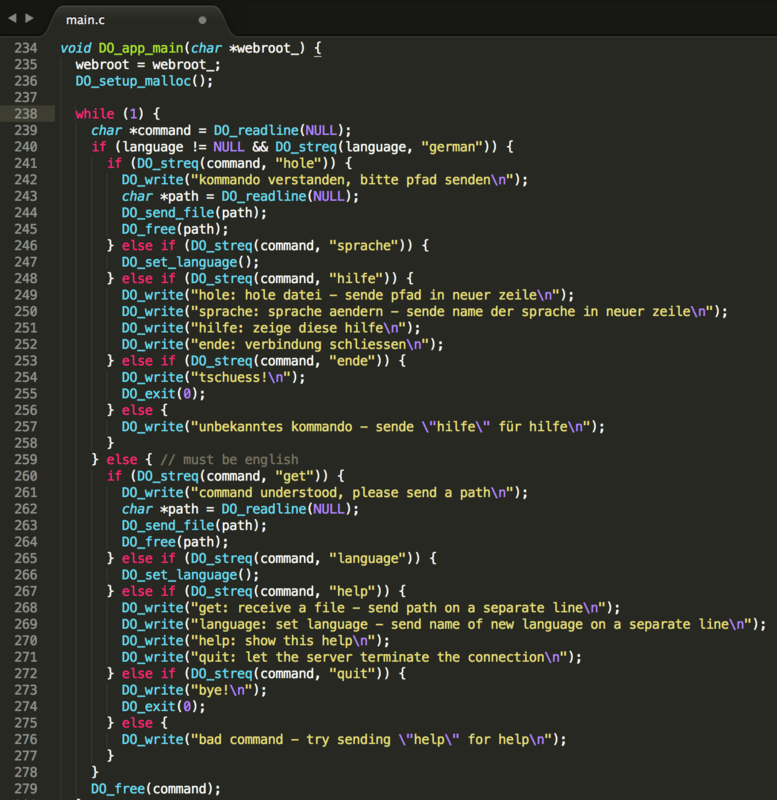 The DO_readline method is used almost everywhere where user-input is gathered, so that is not a problem. However, where are we overflowing to? 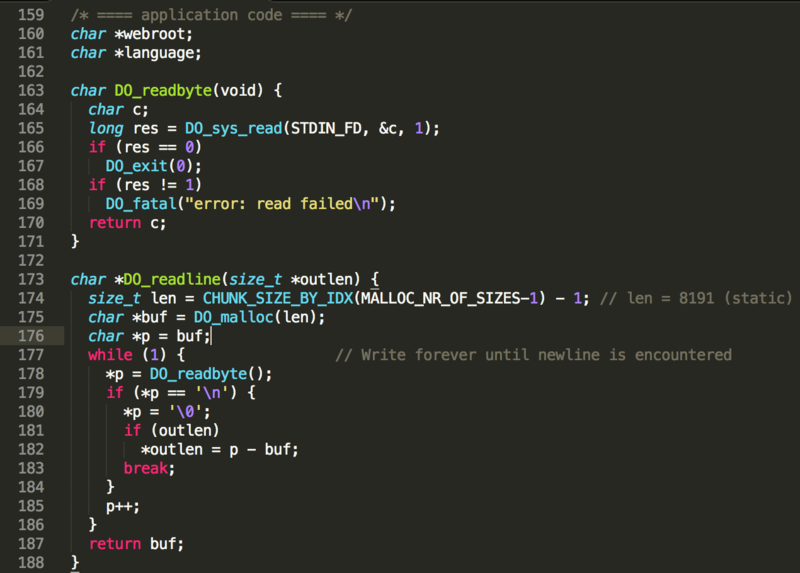 The buffer address is received from the custom memory management implementation of DO_malloc(length). However, 10 singly linked lists of free’d chunks are maintained, one for each chunk size. The head of each singly linked list is stored in a global array, namely malloc_freelist_heads[idx], where idx is the accompanying size index. So concretely, malloc_freelist_heads will point to the head of the singly linked list of free chunks of 8192 bytes, and malloc_freelist_heads will point to the the singly linked list of free chunks of 16 bytes. Of course, these singly linked lists need to be populated when freeing and consumed when allocating. To know to which singly linked list a block must be added upon freeing, the index in the malloc_freelist_heads array is stored in the first byte of the allocated block. Hence, the maximum chunk size that an internal function can request is 8191, not 8192. When freeing a chunk in DO_free(ptr), the first byte of the chunk will be read and interpreted as index, and the address of the free’d chunk will be written to malloc_freelist_heads[idx]. 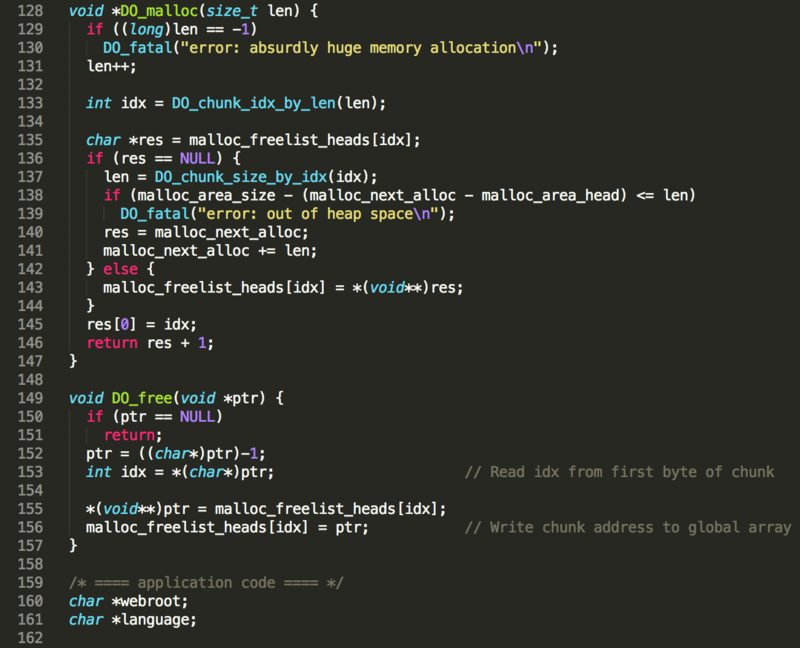 The old address of malloc_freelist_heads[idx] will be written to the first 8 bytes of the free’d chunk first, as a pointer to the previous head of the list. We now have all ingredients to chain everything into a working exploit. 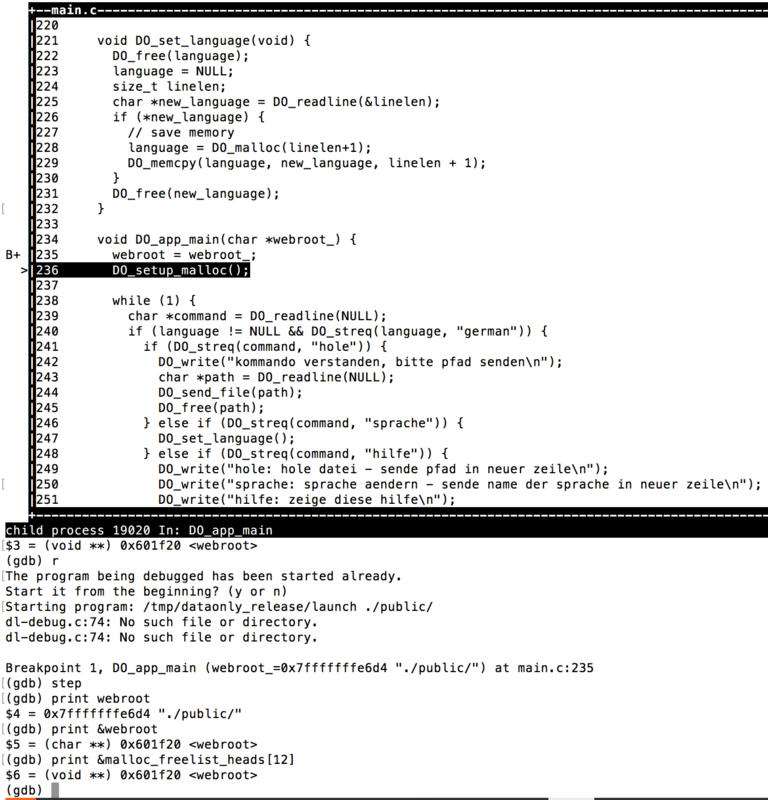 The language command is received first and allocated in the first chunk C1 of 8192 bytes via DO_readline. Then, the random string is received and stored in a temporary chunk C2 of 8192 bytes, also via DO_readline. 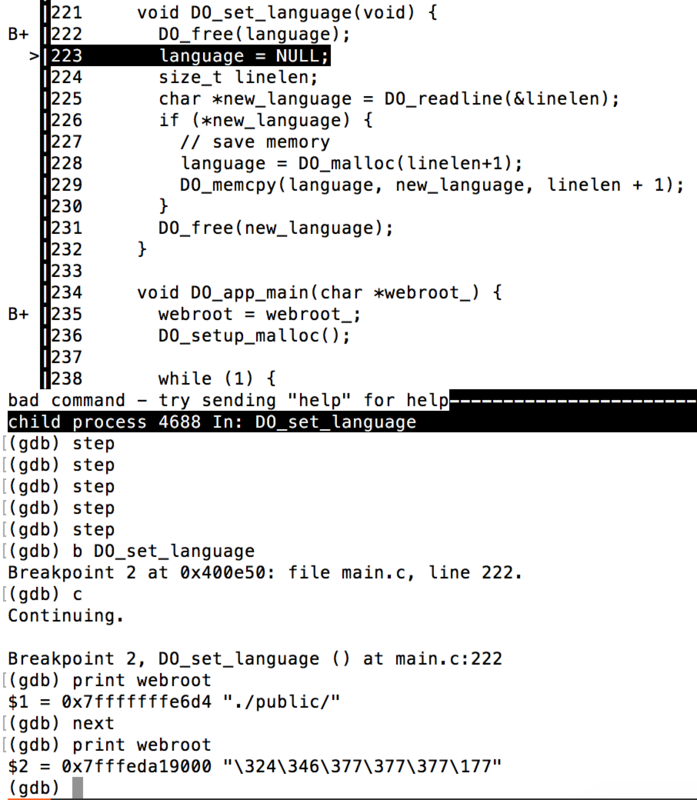 Finally, a third chunk C3 of only 16 bytes is allocated via DO_malloc(len) and the value of C2 is copied over. Hereafter, the remainder of the 10MB heap base remains. As is visualized, malloc_freelist_heads now holds the address of C1, as this was the last 8192-bytes chunk that was freed. In its turn, C1 points to C2, which is also a freed buffer of 8192 bytes. This is the end of the single linked list, pointing to address 0x0. 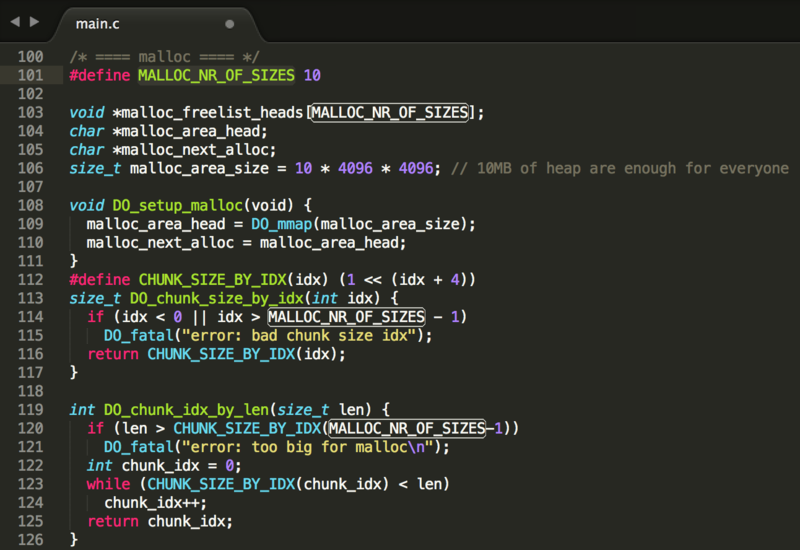 No other single linked list in malloc_freelist_heads[0-8] has been populated at this point. As we can see, webroot is now pointing to C3, which in its turn is free’d and holding the old singly linked list head value of malloc_freelist_heads, which concretely is the address of the old webroot string “./public/”. Although not necessary since ASLR was not enabled for this binary, it would have worked against ASLR-enabled binaries as well, since it only relies on reliable, relative offset overwrites. Cool & fun exploitation challenge! Lessons learned: Don’t ever implement low-level memory management yourself.